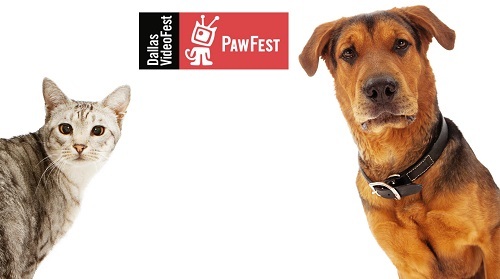 Dallas VideoFest presents the showcase: #PAWFest at Texas Theatre, 231 W. Jefferson Blvd in Oak Cliff, on Thursday, August 23. You pay recall this video festival as “CatFest” in previous years. As much as I love cats, I’m happy the festival team is sharing the love with dogs, too! Take a refreshing break from the dog days of summer to watch some funny, heart-melting, videos of adorable felines and canines. #PAWFest features a new selection of videos curated by Will Braden, the creator of the HENRI, LE CHAT NOIR videos and curator of the original CatVideoFest.com selections featured two years ago in Dallas VideoFest’s first foray into CatFest, and Bart Weiss for the local component. Check out around 100 cat and/or dog videos culled from videos in the categories of Comedy, Drama, Animated, Musical, Action, Vintage, and Documentary. Doors open at 5 p.m., and the videos begin rolling at 7 p.m. The event is open to all ages. Tickets are $15 can be purchased online here. A portion of the proceeds will go to: MADE in Texas Assistance Dogs, The Spay Neuter Network and the Cat Matchers and the Straydogs Inc.